Many people don’t care about their nutrition, or they just don’t have enough time for this. Modern life demands a lot of efforts to keep everything organized, very often one prefers to care about career and relationships instead of healthy eating. Sure, it is much easier to visit nearest fast food café than spend hours cooking something natural and wholesome. That leads to many diseases, excess weight, bad physical shape and poor being at all. Here are several points which prove the importance of healthy diet; these ideas may be used for writing an essay or making a speech on this theme. In a modern world, more and more people suffer from excess weight and in most cases, it is not a few kilograms. At first, it means unattractive appearance and less choice in clothes purchasing. That leads to various complexes, especially for girls. It is true that majority prefers fit bodies from magazines’ covers but not fat one. On the other hand, the results of big weight are slowness, dyspnea, low physical marks and so on. Many people try to use strict diets with a lack of nutrients to become thin, however, it is very harmful for health. It is always better just to balance everyday meals and get into shape bit by bit. The balanced diet can protect human from lots of illnesses. It is proved by the researches that people who follow such practice have a lower risk of cancer, diabetes, allergies and so on. Moreover, when the immune system gets all necessary vitamins person will be protected from seasonal diseases and infections as flu or cold for example. In addition, balanced diet helps to make life longer, and there is no exaggeration. For children, it is important because their bodies are constantly growing and are susceptible for illness much more than adults. It is a well-known fact that things that one eats affect the appearance as well. The secret of pretty and healthy look is not tons of make-up, creams or other cosmetics; the major necessity is a balanced diet. Saturated fats, junk food, sweets, sugars have to be cancelled if one wants to have a great appearance. Unhealthy eating results in acne, morbilli and ulcers, which have a long period of healing and demand expensive medication. A balanced diet also has a good influence on one’s mental health. It helps to overcome stress and depression, develops more energy and makes the person fell up all day. Moreover, certain vitamins and minerals are able to improve the memory, intellectual skills and vision. It is especially important for kids as their brains demand more nutrients for normal functioning. All in all, following healthy diet has a lot of benefits both for kids and adults. Of course, it may demand more time and money however the effects are worthy. One can become stronger and fitter thanks to it. 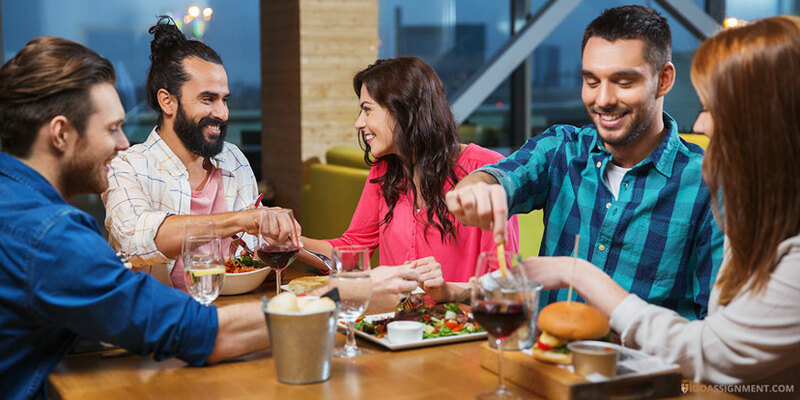 Moreover, despite the average opinion that balanced eating is boring and insipid, it can be very tasty food, as many restaurants today offer specific healthy menus. A balanced diet greatly improves one’s life conditions, helps to avoid illnesses and mental problems as well. Rated 4.5 | 718 votes.